eration ta and FWHM have approximately a minimum values at P = 1.4 torr. axial electrodes. 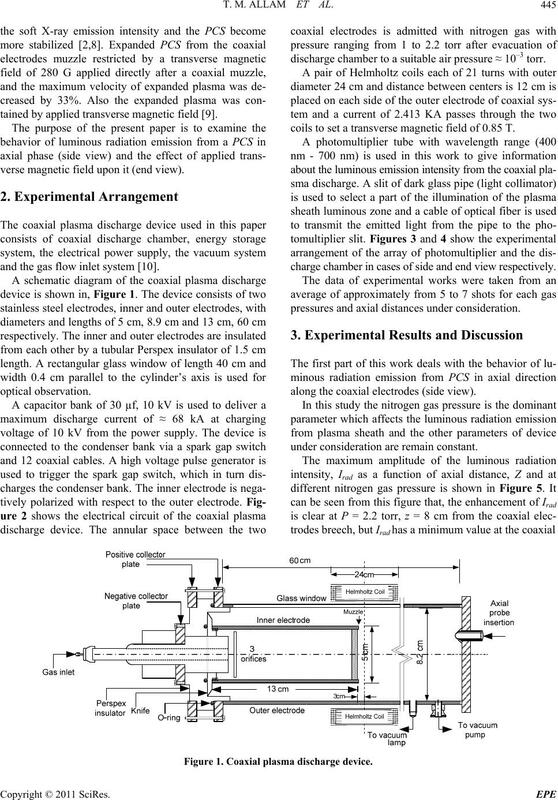 In coaxial plasma discharge of 4.5 kJ . 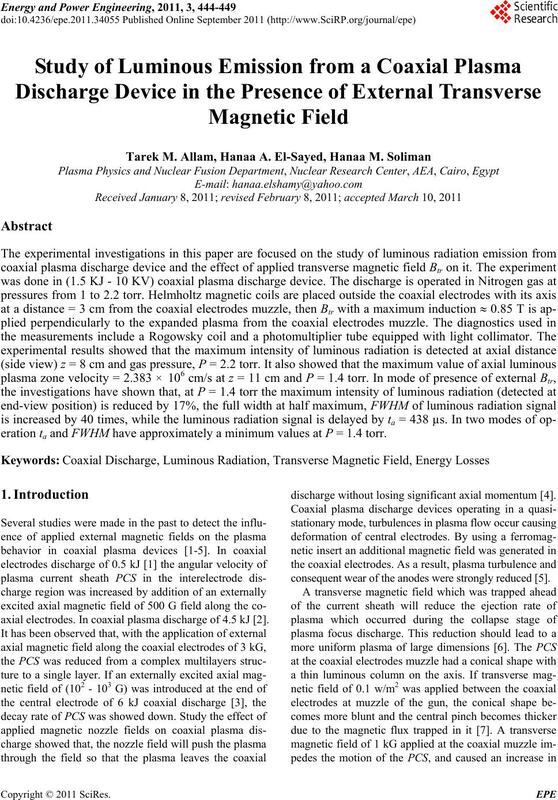 discharge without losing significant axial momentum . consequent wear of the anodes were strongly reduced . tained by applied transverse magnetic field . verse magnetic field upon it (end view). and the gas flow inlet system . discharge chamber to a suitable air pressure ≈ 10–3 torr. coils to set a transverse magnetic field of 0.85 T.
charge chamber in cases of side and end view respectively. along the coaxial electrodes (side view). under consideration are remain constant. Figure 1. Coaxial plasma discharge device. ray of photo-multiplier to the discharge chamber. 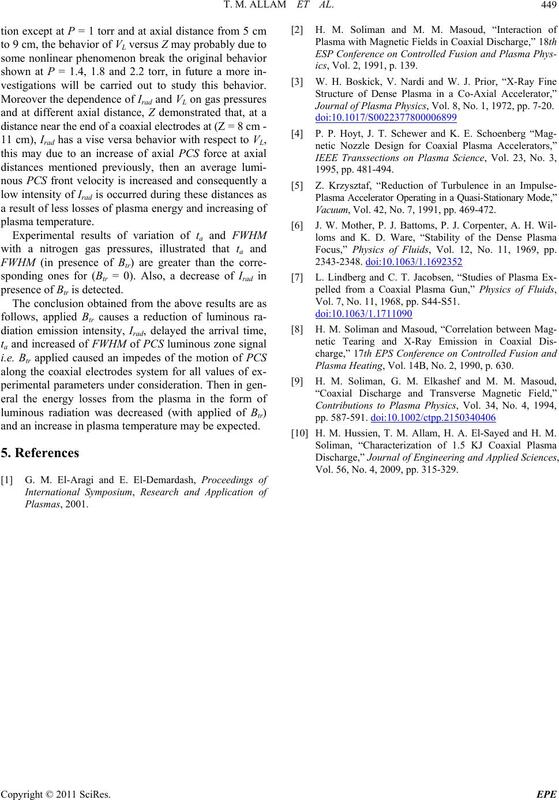 ity and energy losses from plasma. torr, due to inefficient of Snowplough behavior  i.e. 1 torr play an important rule for PCS motion. diation emission from PCS (end-view). luminous zone versus gas pressure. of Btr on plasma flow from coaxial electrodes muzzle. sity from PS, this system is shown in Figure 4.
α P–1.5 in the range from 1.4 to 2.2 torr. normal mode operation versus gas pressure. from 1.2 to 1.4 torr the behavior has an opposite version. the range from 1.8 to 2.2 torr (Btr = 0.85 T) respectively. 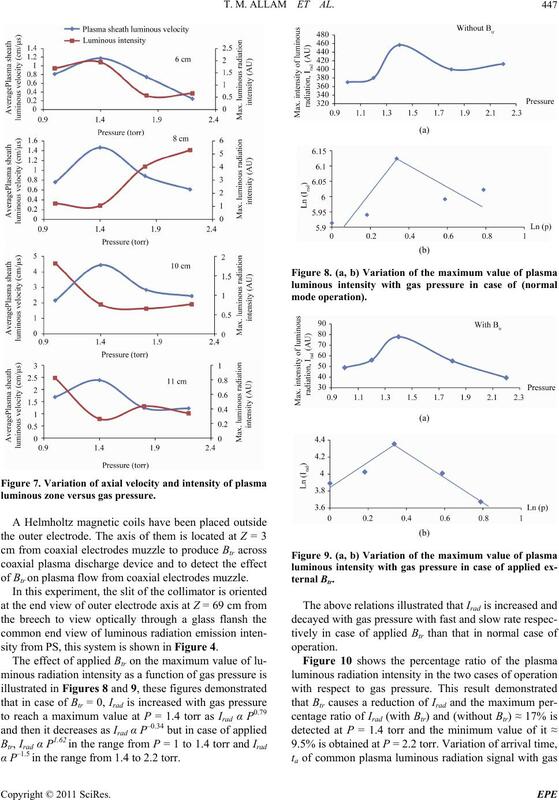 Btr are greater than in normal mode operation, Btr = 0.
plasma temperature raises may be expected. vestigations will be carried out to study this behavior. presence of Btr is detected. and an increase in plasma temperature may be expected. ics, Vol. 2, 1991, p. 139. 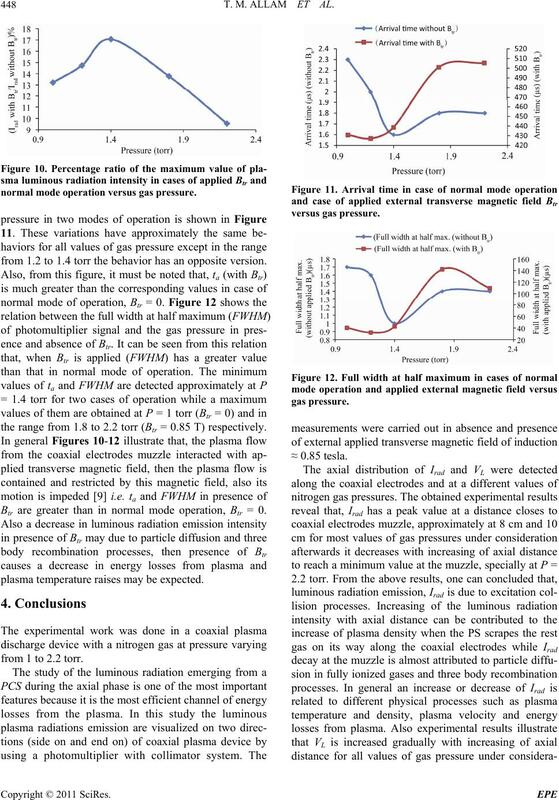 Journal of Plasma Physics, Vol. 8, No. 1, 1972, pp. 7-20. Vacuum, Vol. 42, No. 7, 1991, pp. 469-472. Focus,” Physics of Fluids, Vol. 12, No. 11, 1969, pp. Vol. 7, No. 11, 1968, pp. S44-S51. 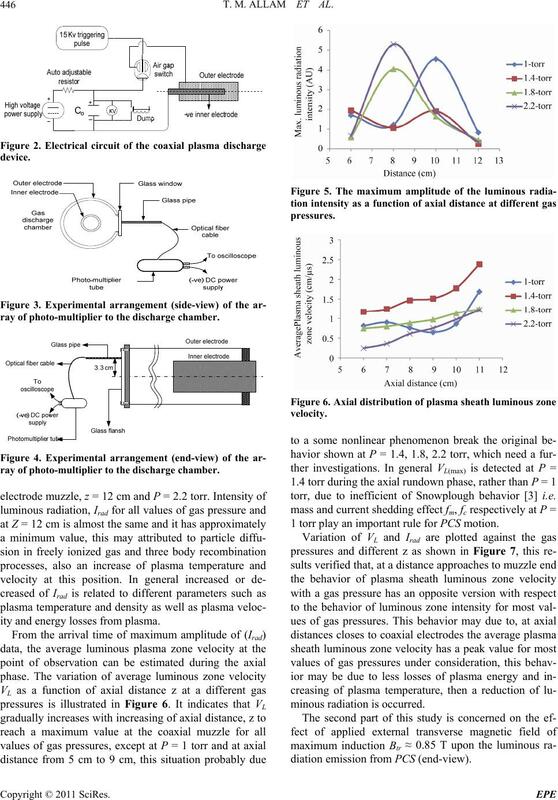 Plasma Heating, Vol. 14B, No. 2, 1990, p. 630.